In today’s busy economy, every business is a consumer and a producer of paper. Tons of paper, packaging, and other items that are made of paper or cardboard which are often thrown right into the landfill. Of course, this practice impacts the environment in a negative way – but what if every company chose to protect themselves and the environment at the same time by shredding? It’s wise for companies to shred paper, especially documents which have confidential or sensitive information. Businesses should discourage excessive printing by employees unless absolutely necessary, and corporate policies regarding wasted resources should be in place. Of course, there will be a sizeable amount of paper generated by the company, but it definitely will need to be disposed of. Hiring third-party destruction services is the right solution. Not only is it efficient, effective, secure and economical, it also helps sustain the environment. Most companies are eco-minded and they recycle tons of paper, but throwing sensitive documents into a recycling bin is never a safe choice. Anyone could find it and pass it on to a competitor, or even worse, actually steal someone’s personal identity. So that your company will never have to face this risk, it’s best to hire destruction services. 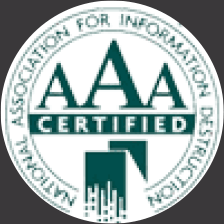 Find a vendor who is NAID AAA Certified and provides you with a certificate of destruction to prove the job was done securely. 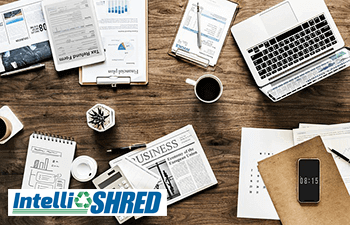 In order to help save the environment from unnecessary damage, most bulk shredding companies will recycle the destroyed paper once it is shredded. Most people don’t know that 100% of shredded paper is recycled. Most of the paper shredded is recycled and turned into products we use daily, like napkins, paper cups, egg cartons, paper towels, writing paper, shopping bags, and more. It’s expensive to produce new paper because of the cost to our environment – when cutting down trees for making paper, it adds more pollution and it requires 70% more energy and water to make than recycled paper. There is proof that recycling paper reduces our environmental impact – for example, recycling one ton of paper saves 17 trees, which absorb a significant amount of carbon dioxide, purifying the air we breathe. Today’s customers not only demand quality in the products and services you provide, they wish to also make eco-friendly purchase decisions. If your company has a greater stance on how it supports the environment, your customers may become loyal to you based on it. If you have sustainable business practices, if you recycle, if you shred, if you reuse items to manufacture products, your customers will appreciate that and buy from you more often. No matter the size of your business, it’s important that you employ destruction services. 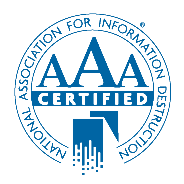 Professional document shredding provides a confidential and secure method. If you want to grow a set of loyal customers, inform them that you are shredding so they realize you are helping the environment.